The milestone mission has ushered in a new era of China's space history. Building on Shenzhou V's one-man 21-hour journey two years ago, Shenzhou VI achieved a number of significant breakthroughs to further push forward our manned space flight technology. The astronauts entered the orbital module from the re-entry module for the first time. 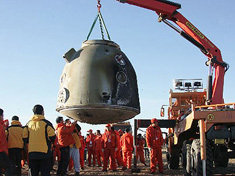 The crew also carried out a series of unprecedented experiments, completing China's first scientific experiments in space with human interaction. As the start of the second phase of China's three-step manned space program, the Shenzhou VI mission will surely lay a solid foundation for further manned missions. Inspired by the success, space officials yesterday unveiled a specific timetable for the second stage - conducting a space walk around the year 2007 and rendezvous docking in orbit by 2009-12. In line with its ambitious space program initiated in 1992, China plans to build a permanent space laboratory and a space engineering system in the third stage, paving the way for the exploration and peaceful utilization of space resources. From Shenzhou I to Shenzhou VI, China has made rapid progress in its manned space program and independently developed mature space technology with Chinese characteristics. Such a feat has fully demonstrated the Chinese people are capable of creating state-of-the-art technology through technical innovation. While celebrating the outstanding achievements, we should also ask a question: What else can we do in other technological fields? It is time to consider the somber fact that China's overall technological strength and competitiveness still lag far behind developed countries. Although China is seen as a world factory, it produces much more in the way of "Made-in-China" goods than "Made-by-China" goods due to lack of independently-developed core technologies. As one of the world's leading exporters, China mainly provides the world with labor-intensive exports of low technology. Technological prowess is one of the important driving forces that propel a nation's economic and social development. In fact, space technology, as one of the cutting-edge technologies, has greatly boosted China's social and economic development in the past three decades. The country has developed a series of civilian satellites, including those for telecommunications, broadcasting, weather forecasting and scientific experiments. Incomplete statistics suggest that nearly 2,000 space technology-related technical novelties have benefited different industrial sectors in the country. Given our success in narrowing the gap with developed countries in such a sophisticated field as space exploration, we should have confidence in strengthening our technological power in more key industries. To that end, the government should increase funding for basic technological research and redouble efforts to cultivate more innovative talent. It is hoped the second manned mission will herald a new wave of technological innovation to enable a rejuvenation of the Chinese nation.